Superficial femoral artery stenting procedure is performed on the major blood vessels of the legs. The major artery providing blood supply to the leg is femoral artery. Femoral artery gets affected the most in peripheral vascular disease. Most common cause of peripheral artery disease is the plaque formation in its lumen which leads to narrowing or occlusion of this artery lumen. These plaques are made up of mostly cholesterol, fatty deposits, cellular debris (waste products), calcium present in the blood and fibrin (a clotting material in blood). This plaque formation is common in individuals having high levels of cholesterol, high blood pressure, diabetes, obesity and a habit of cigarette smoking. It is more common in males and in age group of more than 65 years. Previously, Peripheral vascular diseases were managed by open surgical treatments. Now a days, due to advance in the field of interventional radiology, catheter based minimally invasive procedures are more beneficial. The endovascular surgeon places a metal stent across the narrowed, occluded or stenotic part of the artery. 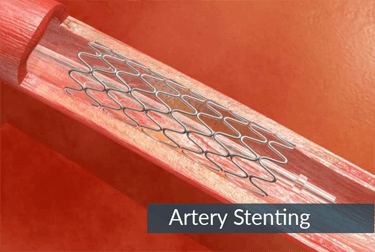 This stent is inserted in order to keep the blood vessel patent and re establishing the blood flow through it by giving internal physical support. Patients having severe pain of claudication (a cramping pain in the legs induced on exercising typically caused by obstruction in the arteries). The interventional radiologist will advise to do angiography of the femoral artery of the legs. The exact area of occlusion or narrowing is located. The patient's vital signs like Blood pressure are checked. Patient might also have to undergo some blood tests to detect diabetes and raised levels of cholesterol. Appropriate medications are given to the patient to make him/her fit for anaesthesia and the procedure. This procedure can be performed under moderate general anaesthesia and local anaesthesia at the site of the puncture. The patient's body parameters such as blood pressure, respiratory rate and pulse are monitored continuously. A balloon catheter (a flexible wire) is introduced in the femoral artery through the groin. This balloon catheter is placed over a guide wire. Ultrasound or X ray guidance is used for better visualisation of the operating area. Once the occluded area is reached, the tip of the balloon is inflated causing the stent to expand and kept in place. Self expandable stents are also available. The balloon is now deflated and the catheter and the guide wire are removed. The length of the stent should cover the entire length of the occluded or narrowed vessel in order to keep it patent. Self expandable stents are usually made up of metal alloy, are flexible and more crush resistant. The balloon inflatable stents are made up of stainless steel and have better deployment. Some of the stents may also contain mediations helping to prevent the formation of blood clots. The choice and the length of the stent depend upon the nature and extent of narrowing of the femoral artery. The superficial femoral artery (SFA) stenting is a very safe procedure. This procedure has excellent success rates reaching up to almost 100%. The chances of maintaining the patency of the vessels also increase after this procedure as compared to other surgical treatments. The occurrence of thrombosis is also found to be less. As there is minimal invasion of the skin and exposure of the injured area, there are very less chances of post operative complications. It also reduces the duration of hospital stay. The recovery time is very short as compared to traditional procedures. Patient can be discharged in maximum 2-3 days.